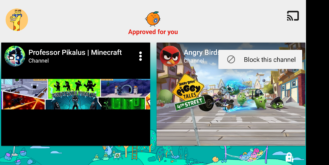 After a tumult of controversies over inappropriate videos being served to children through the YouTube Kids app, it seems like things have settled down with the advent of curated collections, a feature that allows trusted organizations to create pre-selected groups of channels that are generally safe for consumption. 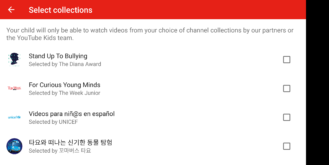 With the big feature out of the way, YouTube is now working on adding granular controls so parents will have options to eliminate select channels or videos from otherwise trustworthy collections. If we drill down into the current implementation of curated collections, there are two things parents can do to limit the videos that are suggested to their children. The first step is to choose collections, which effectively activates a block of subscriptions to channels. From there, parents can look through content and block individual channels by using an option in the overflow menu on suggested videos. Blocking isn't exactly intended to be a part of curated collections, but it can get the job done. While those actions cover most of the things parents really need, it's still not possible to whitelist specific channels or videos if they aren't part of a collection. However, these features are coming. Most of the new text added with the latest update relates to blocking individual channels. Since that's already possible, these changes serve as a good sign that there's a new interface in the works for managing approved channels. However, within those strings are some new lines that also mention approving channels and videos. For example, there are lines that explain certain videos were offered because they were either from collections or channels that had been approved by a parent. Granular controls should be a big step toward meeting the needs of parents while also giving newer and lesser-known channels a way to be included in suggestions. This will also give parents more options for filtering specific content that doesn't fit with religious beliefs or other topical concerns that may be specific to the family.